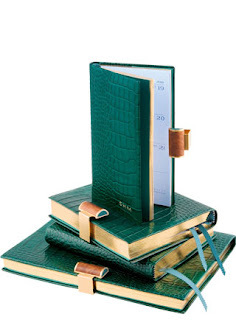 The new Malachite 2010 Diaries from SMYTHSON. 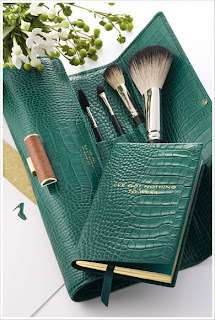 The Malachite Collection's deep green/blue leather with crocodile print takes inspiration from the colours and textures of natural woodland and semi-precious stones. The signature briarwood clasp with brushed gold setting and enamel sides, is made from an Italian briarwood tree root traditionally used in making tobacco pipes. 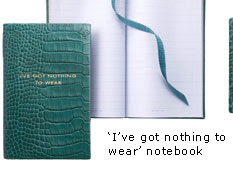 A new series book title has been added with the familiar cry of "I've got nothing to wear".